SAPPHIRE Technology, a leading manufacturer and global supplier of graphics, mainboard and multimedia solutions has just announced a new mainboard developed to support the latest family of CPUs from Intel. The SAPPHIRE Pure Platinum Z77/K is a full ATX sized board that supports the latest generation Intel i7/i5/i3 processor family using socket LGA1155. It includes full implementation of the chipset features, including multiple PCI-Express 3.0 Gen3, USB 3.0, SATA 6G and extensive I/O support. Four dual channel memory sockets are provided, supporting up to 16 GB of DDR3 memory with current technology (32 GB max when suitable modules become available). 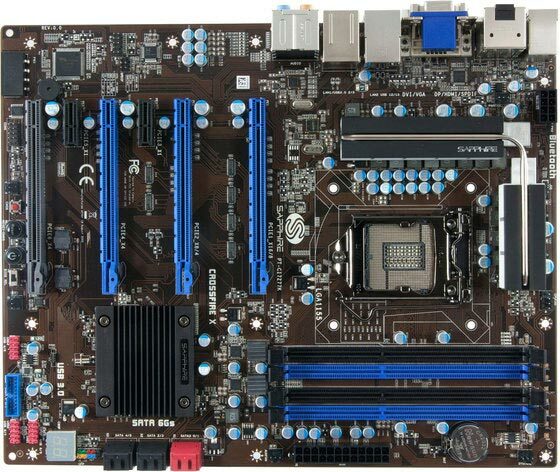 The board has four SATA2 3 Gb/s ports, and two SATA3 6 Gb/s ports featuring AHCI and RAID support, conveniently mounted on the edge of the board with right angle connectors. Advanced connectivity is provided by one Realtek Gigabit LAN and a second optional Killer E2200 Gigabit LAN. There are four USB 3.0 ports (two at the rear and two on a header supported by a high quality front panel kit) as well as ten USB 2.0 ports (4 on the rear panel). The rear panel also carries optical SPDIF as well as the standard I/O configuration for the on board HD 7.1 Audio. Outputs for the on-chip Intel HD graphics are DVI, HDMI and VGA. Extensive expansion support is provided by four PCI-Express Gen 3.0 X16 slots, which allow up to four graphics cards to be used in CrossFireX. 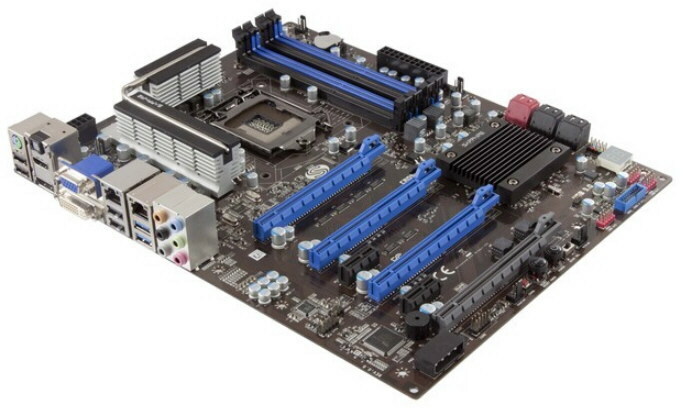 It also has two PCI-Express X1 slots. A standard 4-pin Molex connector on the edge of the board can be used to provide additional power when multiple cards are used. Many user friendly features have been incorporated in the SAPPHIRE Pure Platinum Z77/K, such as digital debug display and a push button reset for the BIOS, as well as start and system reset buttons. These are especially useful for enthusiasts interested in performance tuning or overclocking. The provision of a Dual BIOS allows for experimentation and updates. This board features the SAPPHIRE QBIOS, an easy to use UEFI BIOS with many overclocking features, and includes S_BIOS which allows the user to update and back up the BIOS from within the BIOS – there is no need to boot from an external disk. For the hard-core enthusiast, voltage test pads have been brought out to the edge of the board for the critical voltages on the CPU and memory. The build quality of the SAPPHIRE Pure Platinum Z77/K is high. It has a black multilayer PCB, and uses high quality gold plated connectors for USB 3.0 and LAN. It incorporates many of the high end features associated with the SAPPHIRE brand, such as the use of high reliability solid capacitors throughout. The multi-phase PWM voltage regulation circuitry for both the CPU and memory modules incorporate the SAPPHIRE Diamond Black chokes with coolers that have featured on SAPPHIRE’s high end graphics cards. Low profile coolers on the PWM section give users a wide choice of CPU cooler without risk of obstruction. Hardware monitoring tools and the SAPPHIRE proprietary Mainboard TriXX software allow users to review and adjust a range of system parameters while optimizing performance of the CPU.